As funny as that may seem now, in light of his highlight-studded five-year volleyball career with the Trinity Western Spartans, it bears mentioning today with the news that the former Terry Fox Ravens’ basketball standout has been named a finalist for the most prestigious award in all of Canadian university sports. Following season in which he led the Spartans to repeat title at the U Sports national volleyball championships, and along the way was named both the Canada West and U Sports Player of the Year, Sclater joined UBC women’s volleyball standout Danielle Brisebois as the Canada West’s two finalists for the 25th annual BLG Awards which honours’ U Sports’ top male and female athletes based on athletic accomplishments, outstanding sportsmanship and leadership. One male and one female finalist from Canada West, Ontario, Quebec and Atlantic conferences were announced Thursday (see below). The two winners will each to be awarded $10,000 post-grad scholarships May 1 in Calgary. While Sclater’s university volleyball career speaks for itself, so much of what made him special was the complete package of athleticism, skill, coachability and desire he brought over his entire high school and university career. Or more precisely, you’re in especially rare company if you’ve won B.C. provincial high school MVP status in one sport, then claimed national university MVP status in another, and to boot, won the highest team titles possible in both. 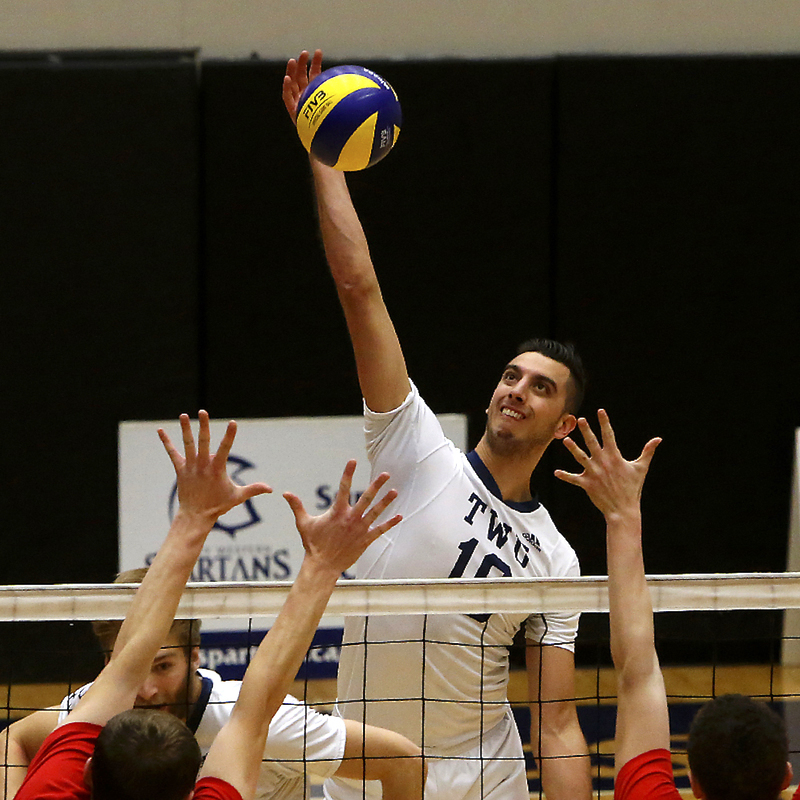 Before his arrival at TWU, the 6-foot-7 Sclater, who starred as a provincial-level volleyball player within the club system (his high school didn’t have a senior boys volleyball team), was named the MVP of the Telus 2012 B.C. senior boys basketball championships after the Ravens rallied to beat Langley’s Walnut Grove Gators 75-74. “That alone tells the whole story,” proud TWU men’s head volleyball coach Ben Josephson said Thursday morning. “The fact that he could go from the peak of one sport to the peak of another speaks not only to his athleticism but also to the dedication of his craft, his hard work and his ability to learn. Sclater was talented enough on the basketball court that after scoring 40 points and grabbing 15 rebounds in a U.S. holiday tournament, he was named to a tourney all-star team that included recruits bound for UCLA, Kentucky and Louisville. “For as long as I can remember, I have always felt just a ton of joy playing not one sport, but everything I could get my hands on,” Sclater, an English major said Thursday, just minutes before writing a final in Foundations of Education at the school’s Langley campus. That’s a great way of saying that Sclater made not only the perfect choice of schools for himself, but the right choice of sport as well. In 2015-16, he was a major catalyst for a Spartans’ team which underwent a complete re-invention from mid-season to winning its first national title in three seasons. And this past season, he finished fifth in the country in both kills (4.29) and points (5.0) per set, those averages helping push him past existing school single-season and career marks in both categories. 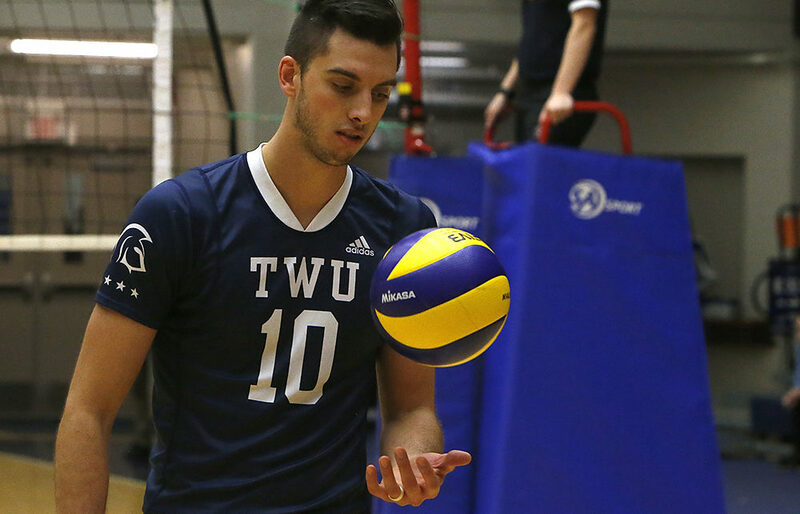 They are accomplishments which put Sclater on the same mantle as previous TWU men’s volleyball BLG nominees like Ben Ball (2012), Josh Howatson (2007 winner) and Chris Meehan (2006). Both Sclater and Josephson point to the 2015 CIS national final against McMaster as the turning point in both the career of Sclater, and the program’s most recent rise to national supremacy. “The moment that summarises his growth and made him the Player of the Year came when we lost in that national final,” said Josephson. “Ryan laid an egg. It was his worst match, he was awful and he let it eat him up. He felt like he let the team down, which he didn’t, but as a perfectionist he took that one and trained like crazy. Everything was golden from that point forward. And with it, a kind of symmetry as he says farewell to his university career. The perfect bookend, of course, to the two national titles won before his arrival, were the two national titles he helped supply before making his exit. Now, the young kid who was first introduced to Josephson at a club volleyball tryout when he scooped up an errant volleyball and laid down a 360-degree dunk, starts his next chapter. Recently married, Sclater and his wife will soon depart for Germany where he joins SVG Luneberg, a team with heavy TWU connections. Brisebois’ career at UBC was equally star-studded. The 6-foot-1 left-side hitter from Caledon, Ont., joined the ‘Birds for her freshman season five years ago and was a role player on a team which won the CIS national title. This past season, however, as its leader, she guided the team to the title and to its collective quenching of a four-year national title drought.